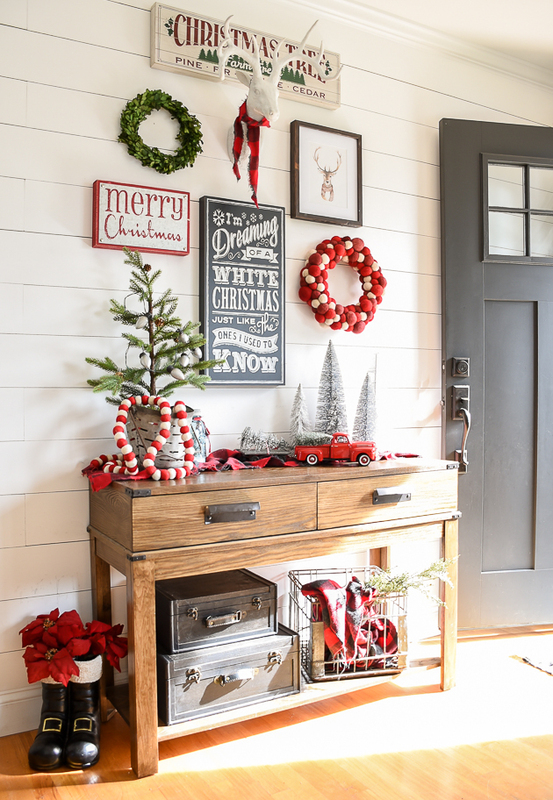 Come take a peek into our entryway and living room all decked out in beautiful modern farmhouse Christmas decor! This post was written in collaboration with Kirkland's. Some affiliate links have been provided. 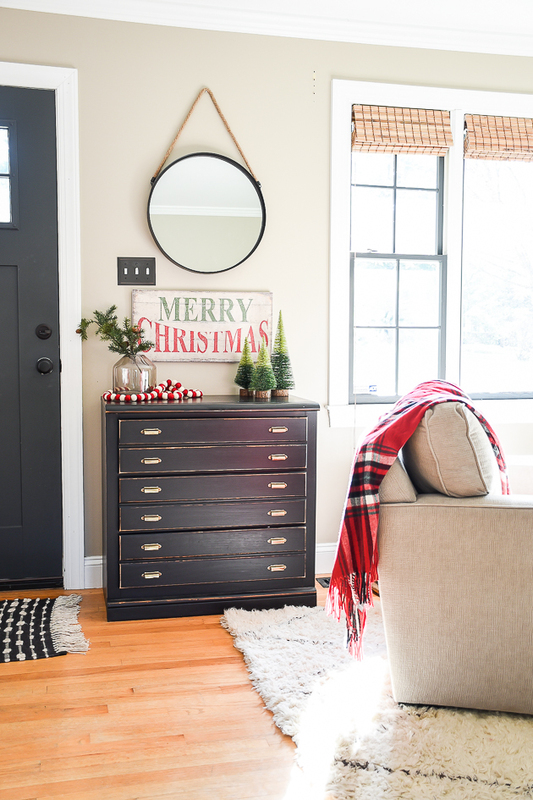 It's nearly impossible to blog about home decor and wait until after Thanksgiving to pull out the Christmas bins, so I threw my "no decorating before Thanksgiving rule" out the window and here I am blogging about Christmas in November. I promise, I still love decorating for fall and Thanksgiving is still one of my favorite holidays. Can we still be friends? As much as I would love to wait until after Thanksgiving to decorate for Christmas, I'm not the least bit sad about adding touches of red and green to our normally neutral home. 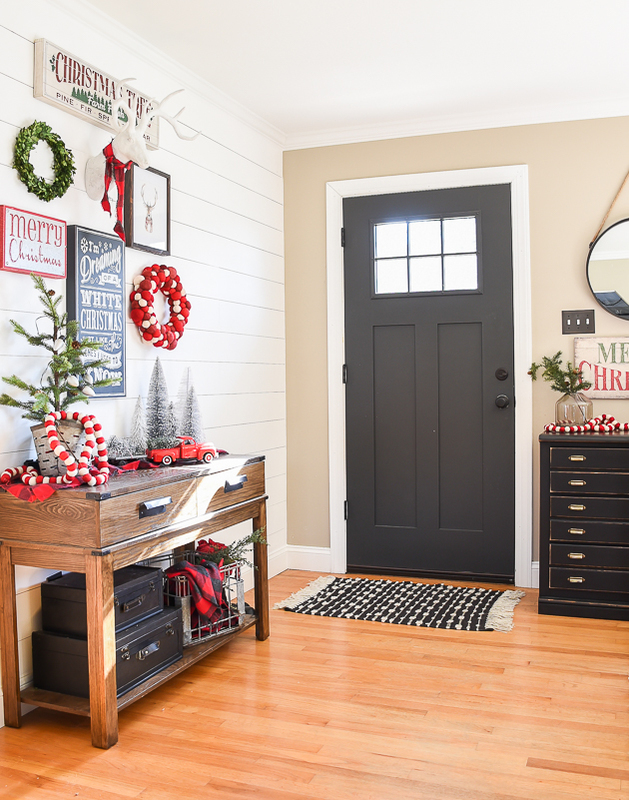 My absolute favorite space to decorate for Christmas (and any holiday/season for that matter) is our entryway. For Christmas, I like to create a gallery wall and this year was no different. 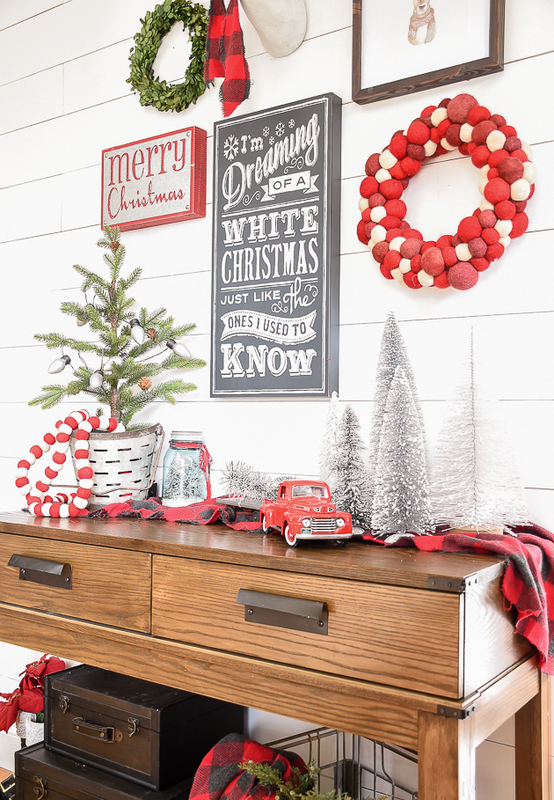 I used a lot of the same wall decor that I used in last years display, but I did add a few new pieces, including this wooden Christmas tree farm sign. 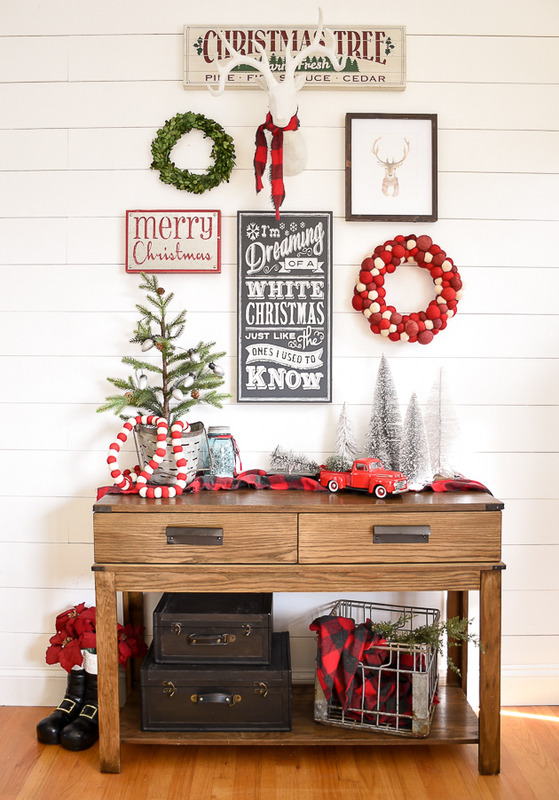 The red and green in the sign tie in beautifully with the rest of the gallery wall decor. I get a lot of questions about how I hang the many different gallery walls in our entryway, so I thought I would share a few tips. First, I try to use the same screws where the mirror normally hangs. For the rest of the pieces, I use tiny nails that I hammer in-between the planks. This way when the nails are removed the holes are barely visible. My other trick is to use Command Strips. 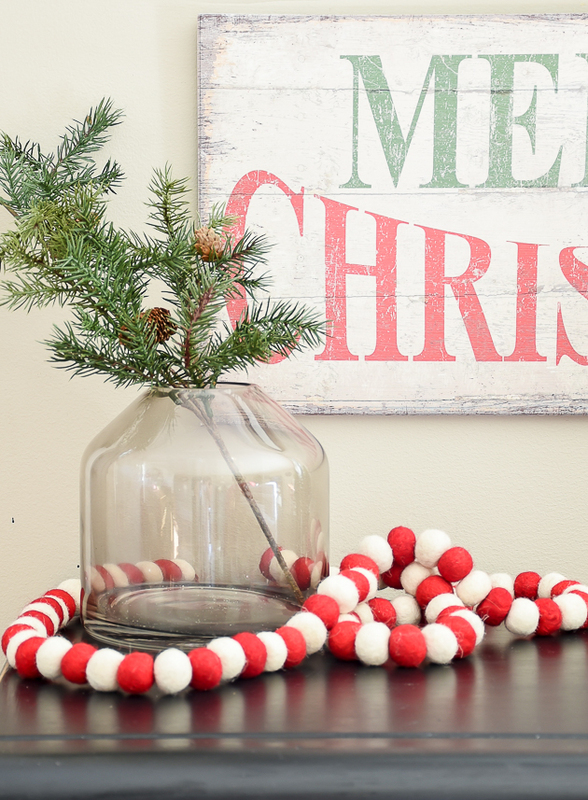 They are a total life saver for hanging seasonal and temporary decor. I've been loving bottle brush trees lately, so of course as soon as I saw these silver "snow" covered trees I knew they would make a great addition to my table decor. Don't you just love that little red truck and trailer? 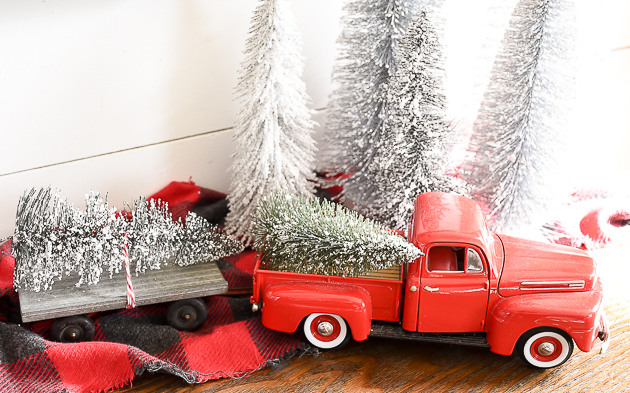 The truck was my sons, but now I use it for my Christmas decor and the trailer he snagged for free at a local flea market. He was playing with it and a nice lady said he could have it. I think I was more excited than he was, ha. I also added a few green ombre bottle brush trees to the black chest by the front door. I love that they are a little more fun and unique compared to traditional bottle brush trees. 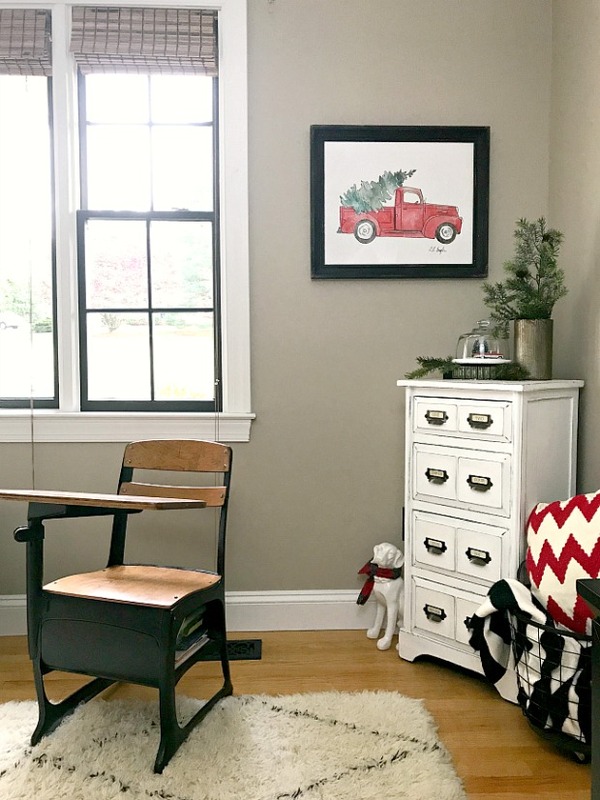 On the other side of the window I hung framed artwork of a red truck carrying a Christmas tree, which reminds me of the little red truck and tree on the entry table. 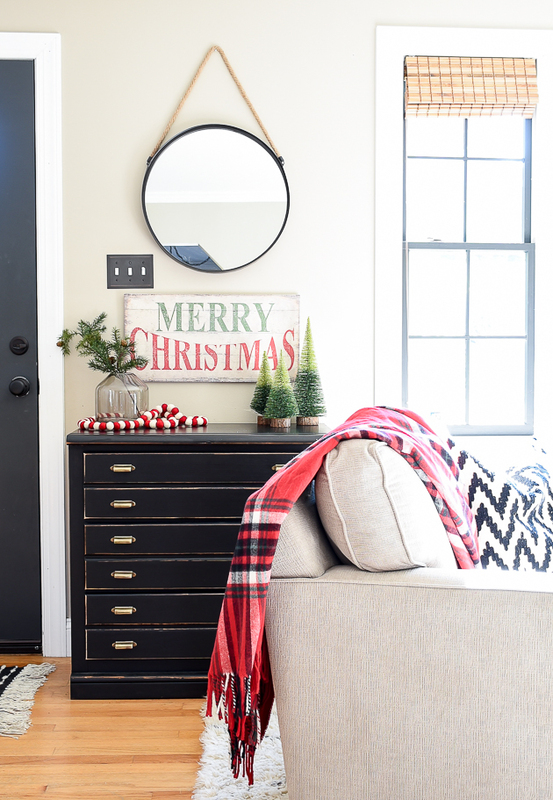 And here's even more holiday inspiration from some very talented blogger friends. Wait, there's more! Kirkland's is offering one lucky reader a $500 gift card to help you decorate your home for the holiday's. Giveaway ends November 24th 2017, must be 18 to enter, US residents only. 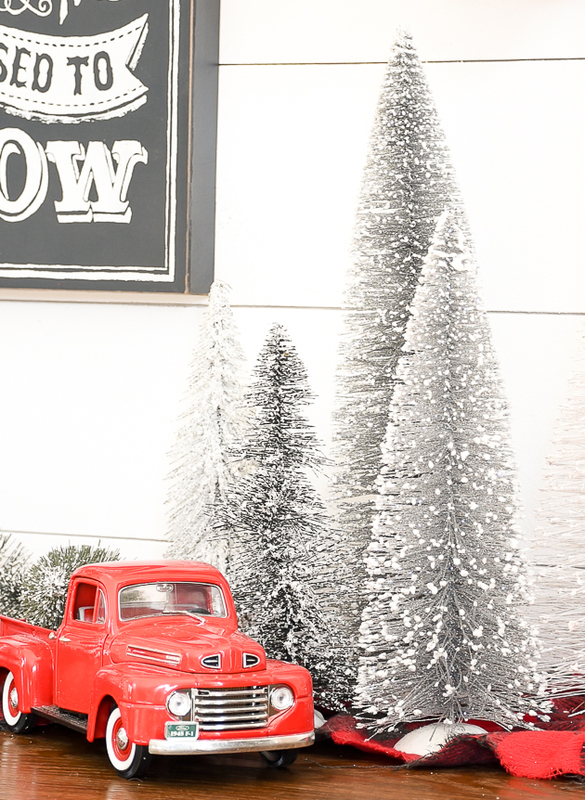 I really love the silver bottle brush Christmas trees! You knocked it out of the park again! This is beautiful! I LOVE all the red! I Love this! Love those Santa boots! Wonderful job! GORGEOUS!!! I love the simple use of classic Christmas colors!!! Very pretty! Love the button tufted gray settee. 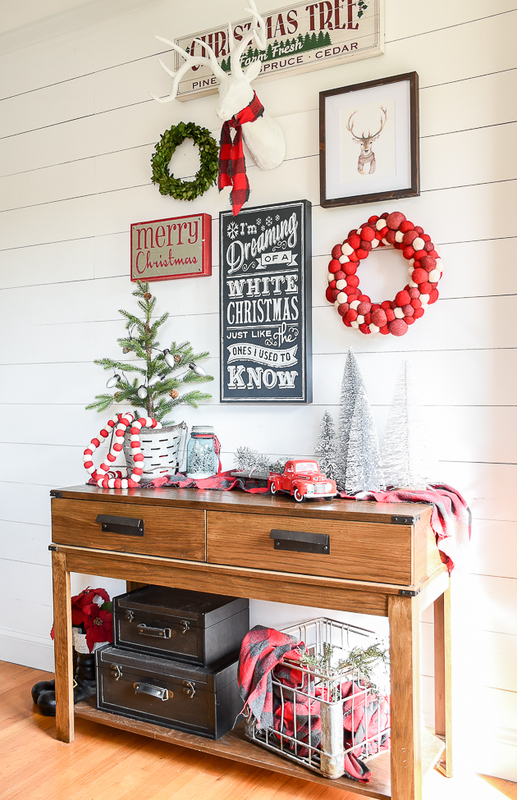 I LOVE all you decorations,but I do have to say that my favorite is the "Santa " boots, the frames vintage red truck, and the little Christmas tree in the olive bucket!! I love the simplicity that allows you to focus on the adorable accents. The simplicity allows you to focus on the adorable accents. Love it! I love that framed print of the truck with the tree in the back. I'm going to have to get to Kirklands! 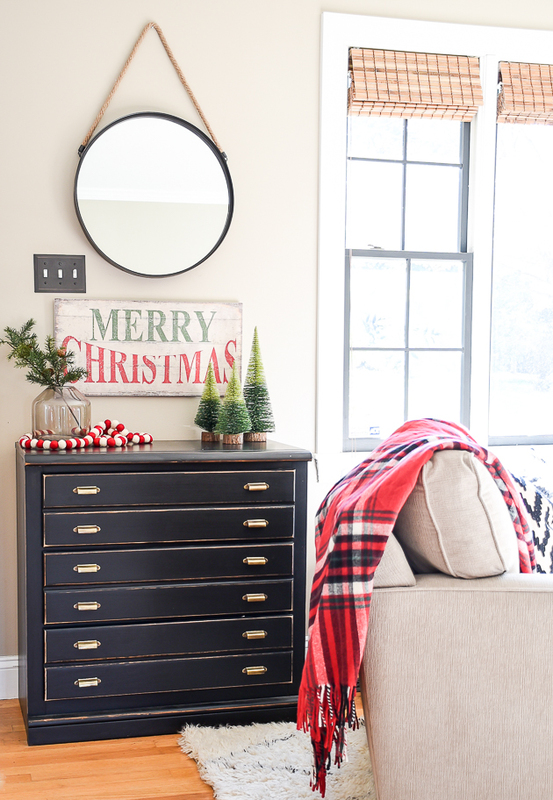 Love, love, love the holiday throw and chevron pillow. Your style ROCKS!!! So pretty and festive! I love your gallery wall in your entryway. I actually love those bottle brush trees too - I need to get out there and stock up on some! I love and will probably be purchasing the Christmas Tree, wooden sign. But I could name many, many more!!!!! I love the Christmas Tree, wooden sign. Also those bottle brushes have always been a favorite of mine. anything copper really but those copper canisters. are killing me! Hi can you tell me where the table is from? The table was purchased from HomeGoods a few years ago. It was a lighter wood and I updated it with stain and custom bin pulls.